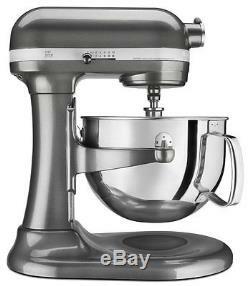 Kitchenaid KP26M1X 6 Quart Pro 600 Large Capacity Stand Mixer. Refurbished stand-mixers do not come with pouring shields. The Professional 600 Series 6-Quart Bowl-Lift Stand Mixer is perfect for heavy, dense mixtures. Burnished metal flat beater, PowerKnead Spiral Dough Hook and 6-wire whisk will help you mix, knead and whip ingredients into culinary masterpieces quickly and easily. And for even more versatility, the power hub fits optional attachments from food grinders to pasta makers and more. Choose from all the color options to find the one that best matches your style and personality. Power Hub (Over 12 Attachments Available). The power hub turns your stand mixer into a culinary center. With more than 12 optional attachments use the power of your stand mixer to help you make fusilli pasta from scratch, shred a block of Parmesan cheese in seconds and so much more. Stainless Steel Bowl with Comfortable Handle. Stainless steel bowl with comfortable handle offers enough capacity to mix dough for 13 dozen cookies, 8 loaves of bread or 8 pounds of mashed potatoes in a single batch. The bowl is also dishwasher-safe for quick and easy cleanup. 67-Point Planetary Mixing Action means 67 touch points per rotation around the bowl for thorough ingredient incorporation. The beater, dough hook or wire whip rotates around the bowl, giving incredible bowl coverage for comprehensive mixing. The item "KitchenAid RKP26M1XQG 6 QT Pro 600 Large Capacity Stand Mixer Liquid Graphite" is in sale since Friday, May 18, 2018.